New Brunswick is home to a small population of sparrow sized migratory shorebirds known as Piping Plovers. These annual visitors to the Acadian Peninsula region of Northern New Brunswick are considered, “Species-at-Risk.” In other words, they are on the verge of extinction. However, we the people, naturalists, environmentalists, tourists and local nature lovers, have within us the ability to STOP this precipitous decline if we choose to respond to their call. I have patrolled these sensitive nesting areas for the past eight years and have enjoyed an intimate relationship with the birds and the beauty of their nesting habitat. Unfortunately, these sand and pebble colored residents of the beaches are so well camouflaged it works against them, especially when 4 x 4 vehicles or itinerant ATV riders roll over the nests and chicks who are comingled with the rocky seashore they choose as their temporary home. The approximate global population of Piping Plovers consists of some 6,000 adults, of which approximately 2,000 are found along the coastline of Atlantic Canada. Beginning in April, the Piping Plover arrives in New Brunswick from its southerly wintering grounds--Florida, North Carolina and the Bahamas. They search for suitable nesting beaches that provide food, security and protection for their brood of chicks. The prognosis for this species at risk may be improving. Studies and research conducted by the federal government (Environment Canada – Canadian Wildlife Service; Canadian Heritage – Parks Canada); provincial Department of Natural Resources and Energy; and non-government organizations such as the Piping Plover Project of the New Brunswick Federation of Naturalists and the Irving Eco-Centre – La Dune de Bouctouche—have begun to show a few positive signs. But how do you define HOPE? Is it governmental concern for the survival of the species? Is it finding adequate funding for more research and protection programs, encouraging volunteer groups to do the work the Federal and Provincial Governments cannot or will not, or, as some feel, all of the above? Instead, HOPE can only be defined as a concerted effort by concerned citizens to step-up and do what we can with or without the cooperation of faceless bureaucrats in the nation’s capitol. Legislative leaders and bureaucrats are so self absorbed with their own importance and survival that they have no clue of the world around them. As concerned citizens, can we wait for ineffective policies and unfunded programs to respond to matters of urgency? The simple answer is NO! Government employees walk on egg shells when asked to help privately initiated programs. The standard bureaucratic response is “Please don’t make waves!” Job security comes first for a bureaucrat, and ruffled political feathers can make life in the bureaucracy a hell-hole for anyone who attempts to tell our public servants what is needed. So while bureaucrats kowtow to ineffective politicians, hope for the future of the Piping Plover dangles in the balance. Why is the Piping Plover endangered? The three main threats to the Piping Plover’s survival are: (1) habitat loss or degradation; (2) predation; and (3) human disturbance. Piping Plover nests and their off-spring have become victims of unpatrolled nesting beaches by uneducated users of vehicles, tourist foot traffic and unleashed dogs. The quantity and quality of habitat available for nesting Piping Plovers has also decreased because of beach destabilization that has resulted from draining wetlands for subdivision and cottage development, public beach sites and other community park development programs. These disturbances physically alter the characteristics of the land adjacent to these sensitive beaches and make them unsuitable for nesting. Beaches also become unsuitable from natural causes such as vegetation encroachment or erosion caused by ice scour and storms. These natural habitat losses normally would force Piping Plovers to relocate to new beach areas; however, with an increasing amount of coastal development, few habitats exist that allow plovers the option of finding suitable alternative nesting sites. As a result, Piping Plovers are often forced to nest in areas of sub-optimal habitat. The number of young produced in sub-optimal habitat is usually lower. The obvious question is “does commercial expansion trump protecting of a wildlife species? The answer is not necessarily yes. The eggs and young of Piping Plovers are vulnerable to several predators commonly found in these areas. The main predators of Piping Plover are crows, foxes and gulls, but raccoons, weasels, mink, owls, small birds of prey and even domestic and feral dogs and cats may kill adult birds and chicks or destroy eggs. Agricultural and housing developments near nesting beaches can attract predator populations and increase the risk of nesting failure. Beaches with ineffective or insufficient litter management also tend to maintain unusually high predator populations and can lead to lower survival rates for young birds. Increased beach visitation by people, and unrestricted or supervised recreational vehicle use on beaches, poses a considerable threat to critical nesting habitat throughout the nesting area. New recreational equipment including all-terrain vehicles, personal watercraft, wind surfers and kayakers make it possible for humans to access areas that were once difficult to reach. Therefore, many formerly isolated nesting areas now receive an increasing amount of human traffic. Off-road vehicles are especially problematic. Vehicles may crush eggs since the nests are well hidden in the sand and resemble small round pebbles. Vehicles create ruts in soft beach sand that make movement for small chicks difficult and, if sufficiently deep, may actually trap chicks so they cannot escape. 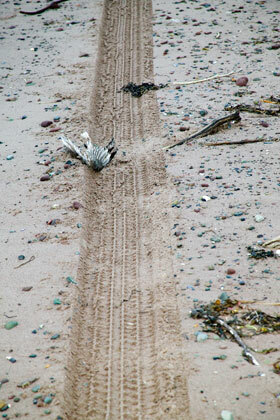 Vehicles imbed seaweed in the sand so developing plovers cannot access their food often located there. Studies have demonstrated that fewer chicks survive on beaches with heavy human disturbance. When Piping Plovers are disturbed, they spend a great deal of time and energy in trying to distract potential predators or in some other way of trying to protect their chicks. On very cool and very hot days, young plovers must be sheltered by the adults since downy chicks are unable to regulate their own body heat effectively. Since chicks must grow very rapidly in order to be able to fly within 25 days after they hatch, the chicks must spend their time continually feeding during favorable weather conditions in order to gain the necessary body weight. Research indicates that chicks that are unable to achieve a critical body weight by ten days of age do not survive. Learn more about Piping Plovers, the threats they face and educate others about responsible beach use in nesting areas. Contact an agency in your area working to protect the Piping Plover. You could become a Piping Plover guardian or help in some other way with the recovery of the species. Respect all areas with signs and fencing identifying them as sensitive wildlife areas or nesting areas. Move through the area quickly and adhere to the posted signs and observe the birds from a distance with binoculars or with a spotting scope. If you think a Piping Plover is nesting in an area you are visiting, do not try to find the nest or linger in the area. Report your findings to the local Wildlife Service. Always keep pets on a leash while you are on a beach with nesting Piping Plovers, or when young chicks are present. Never leave litter on a beach. This may attract potential predators to the area. Follow laws and regulations restricting the use of off-road vehicles in sensitive habitats. If you are unsure if vehicle restrictions are in effect, contact the nearest office of the Department of Natural Resources. Help your political leaders develop a plan that restricts vehicles and pedestrians from accessing the nesting areas during breeding, incubation and chick development times. Become a volunteer and beach watcher in conjunction with a local conservation group. Educate friends and family about the need to protect sensitive nesting areas. My friends and I would appreciate you help.